With InDesign CS5, Adobe’s page layout program has assumed a new dimension that takes the app beyond the traditional boundaries of print production. This new version lets you create documents that can incorporate complex interactivity, animation, Flash video, and MP3 audio files without working in a timeline or writing code. InDesign CS5 also offers enhanced support for the ePub file format. The new version makes it easier to export documents in SWF format, hand off layouts to Flash Professional CS5, and produce ePub documents for use with popular eBook readers and devices. For designing across media types, InDesign’s new Page Selection tool lets you choose individual pages to resize and repurpose for Web, interactive, mobile, and eBook projects within a single document. The new version also offers simplified object selection and editing, track changes, paragraphs that span and split columns, a redesigned Layers panel, various production enhancements, and integration with Adobe's new online CS Review for faster online peer and client reviews. 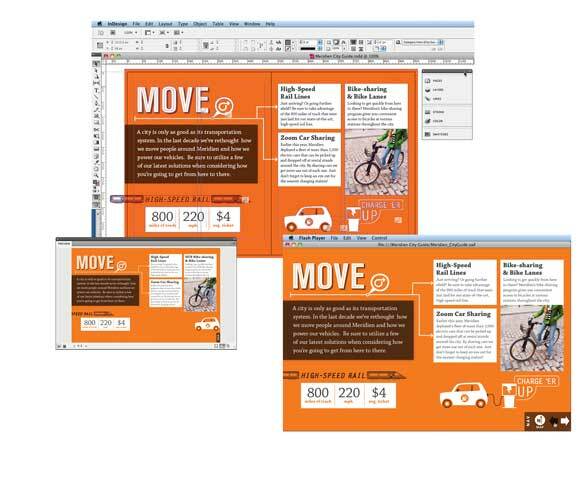 InDesign CS5 lets you create online reading materials with integrated interactivity, video, sound, and animation. A new document-installed fonts feature helps avoid missing fonts during production and printing. InDesign CS5's product family includes Adobe InCopy CS5 and InDesign CS5 Server for editorial collaboration and automated design and publishing. InDesign CS5 is $699 with an upgrade price of $199. It’s also part of the Design Standard and Design Premium bundles and the Master Collection. InCopy CS5 is $249 with an upgrade price of $89. Both run on OS X 10.5.7 or 10.6. The InDesign CS5 family ships within 30 days.